The Snitz Creek Cabinet Shop has been in business for over four decades and heat has always been a large overhead cost. 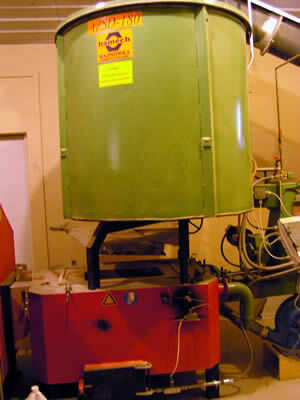 We have burned our waste biomass starting in 1996 in a homemade boiler. By the time the boiler had been “perfected” it’s life was over. In 2005 we found a commercial gasification unit from Europe to burn our waste. It was designed from the ground up to burn our type of by-product and was much more efficient than our old system. . 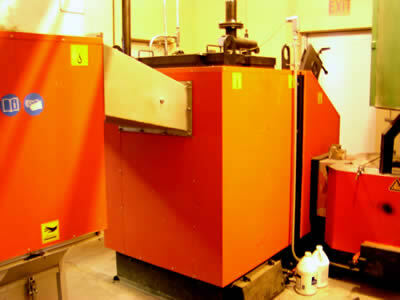 In the summer time we grind and store the collected material in a large bin. In addition to reducing landfill waste, wood gasification relieves our dependence on oil, electricity and gas for heat. After seeing the huge return on our investment at the shop, we decided to give wood gasification combined with hot water storage a try in our residence. It made a tremendous difference in the amount of wood we burned through the cold season compared to the conventional wood boiler that was used for the prior two seasons. Due to our success with the boilers and our passion with alternative energy solutions, we began showing our boilers to dozens of people interested in the new technology which in turn has led us to start the new entity, SmokeLess Heat LLC, to share these solutions with others.